There is a "stone" that is used in jewelry that is ALL over Etsy right now. It's beautiful! A rich cobalt blue with sparkling flecks of silver and gold and it looks like a GALAXY of stars in the night sky! I love it and offer it in my shop as well. But what is it? Is it a gemstone? NO! It's definitely NOT a gemstone, NOT a mineral, NOT semi-precious, and certainly *NOT* Aventurine, which I've seen it described as on Etsy! And NOW I've seen this being sold online as "Blue Sandstone" where the seller describes this as: "composed of quartz or feldspar because these are the most common minerals in the Earth's crust. The sand inside creates the blue color. For this reason, this substance is named "Blue sandstone." YIKES! This is like a random string of words---none of it makes sense! (Blue sand??) No, this is not "sandstone". It's not a stone at all. It is GLASS. Yes, Glass. It's a manmade glass that is actually far more than just sparkles tossed into molten glass. It begins with molten glass (silica), and copper oxides and other oxides are melted together. The vat is then sealed off from the air (a vacuum chamber) and kept at a certain temperature, so the glass remains liquid while allowing copper crystals to form without the crystals melting or oxidizing! When cooled, the glass will have bright metal crystals suspended in semi-transparent glass. 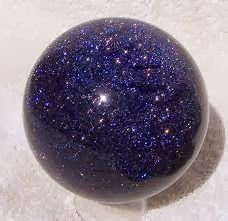 If you google "how is goldstone made" you can read exactly how the glass manufacturers make this beautiful, glittery glass "stone". It's truly fascinating to look at, whether it's gold (goldstone), blue (stellaria or blue goldstone), green or even purple!